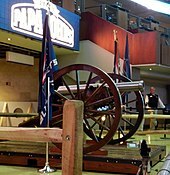 The Blue Jackets were founded as an expansion team in 2000. The team qualified for the Stanley Cup playoffs for the first time in 2009. 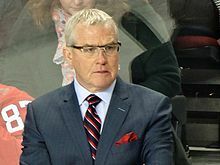 They won their first playoff series in the 2019 playoffs against the Tampa Bay Lightning, becoming the first team in NHL history to sweep a Presidents' Trophy winner in the first round. ^ "Team Quick Facts" (PDF). 2017–18 Columbus Blue Jackets Media Guide. NHL Enterprises, L.P. October 6, 2017. Retrieved May 8, 2018. 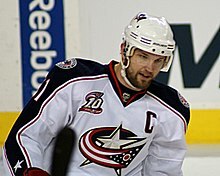 ^ "Blue Jackets, Cleveland's Lake Erie Monsters announce multi-year AHL affiliation agreement". Columbus Blue Jackets Official Website. Columbus Blue Jackets. Retrieved 17 April 2015. 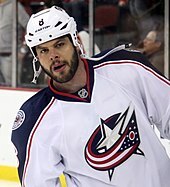 ^ "Nathan Horton Could Make NHL History By Not Playing Against Stars". 8 April 2014.